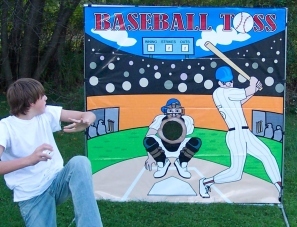 Baseball Toss is a winner at any sporting event, fund raiser, or carnival. We've taken the great American pastime and turned it into a simple but irresistible game! Nobody can walk by the Baseball Toss game without giving it a shot. This compact, low maintenance, low cost product will really boost your profit potential. Like all of our games, Baseball Toss can be set up in less than five minutes and can be used indoors or out.